The below artworks are the most important by Frank Gehry - that both overview the major creative periods, and highlight the greatest achievements by the artist. Artwork description & Analysis: During the late 1970s and 80s, Gehry designed a number of residences and small public buildings in California. 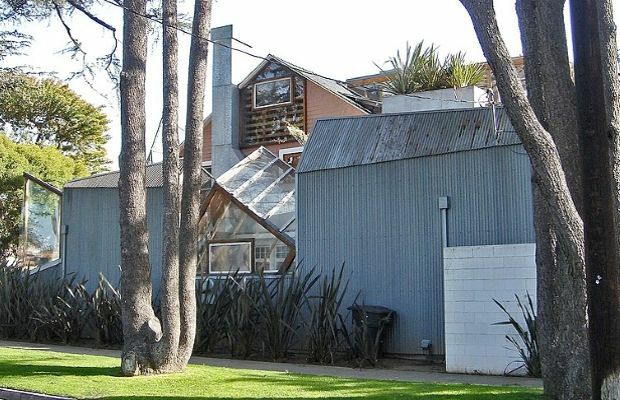 Of these, the Gehry Residence in Santa Monica was the most influential owing to its unique concept and daring style. The house was home to the architect and his second wife Berta and it evolved from a 1920s Dutch colonial style building which they had purchased. Strikingly, Gehry chose to leave the original building entirely intact and to build around it, linking his design directly into the colonial façade and remodeling the interiors to create a sense of unity and movement between old and new. His contemporary design surrounds the property like a shell and the insertions serve to make it look as if the modern outer layer has been pulled apart, revealing the 1920s building within. Describing this interplay between the structures, Gehry spoke of his intention to "build a new house around the old and try to maintain a tension between the two". Artwork description & Analysis: The Vitra Design Museum, founded by Rolf Fehlbaum in 1989, holds one of the world's largest collections of furniture and is one of a group of buildings designed by notable architects including Tadao Ando, Alvaro Siza, and Zaha Hadid, which make up the Vitra Campus. These buildings were commissioned in response to a fire on the original site in 1981, which destroyed factory buildings owned by the furniture design firm Vitra. 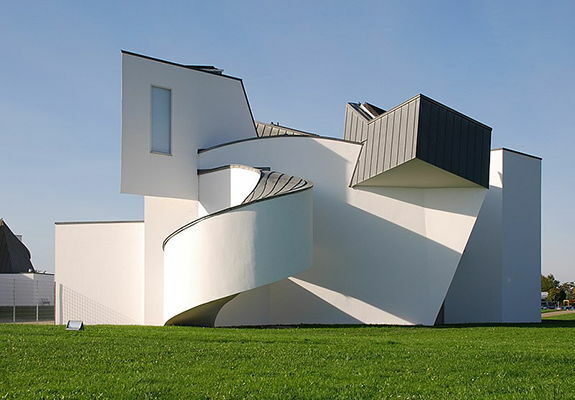 Today, the Vitra Campus is not just a production site but a celebration of design and architecture. The museum was Gehry's first European commission, designed in collaboration with German architect Günter Pfeifer. It owes its innovation, not only to the architects, but to the client's brief that sought an expressive and ambitious design. Built with white plaster and zinc, the museum has both angular and curved elements and appear to reference Le Corbusier's nearby Notre Dame du Haut. Gehry's building also responds to others in the complex, echoing the height of the adjacent factory building by Nicholas Grimshaw. The result combines industrial architecture with modern art - reflecting the ethos of the campus, which celebrates a range of design practices. The use of zinc can be seen as introducing Gehry's later extensive use of polished metal cladding. 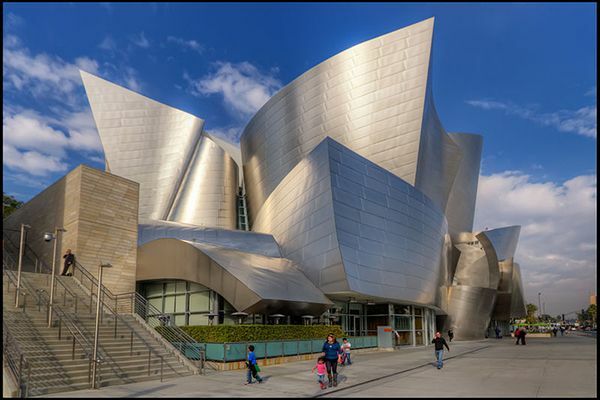 In fact, the building as a whole has been cited as exemplifying Gehry's transition from small-scale Deconstructivist projects like the Gehry Residence to later, grander works such as the Walt Disney Concert Hall. Made up of towers, ramps and cubes, the shape of the building responds to the museum's lighting and programming needs. Sections containing production areas, a showroom, test laboratory, cafeteria and offices are joined together to form, as architectural critic Paul Heyer notes, a "continuous changing swirl of white forms...each seemingly without apparent relationship to the other...[which] resolves itself into an entwined coherent display". Gehry himself wrote of its shape: "I love the shaping I can do when I'm sketching and it never occurred to me that I would do it in a building. The first thing I built of anything like that is Vitra in Germany". Thus, the building combines a functional interior with an extravagant and sculptural exterior, the latter concealing the former. Artwork description & Analysis: The Dancing House, more formally called the Nationale Nederlanden Building (after the Dutch insurance company who financed its construction), is a collaboration between Gehry and Croatian-Czech architect Vlado Milunic. The two architects developed Milunić's concept of a building in two parts - one static and one dynamic. This was intended to symbolise the transition of Czechoslovakia from a communist regime to a parliamentary democracy. It is now most commonly associated, however, with two dancing figures. Consequently, the building is sometimes nicknamed Fred and Ginger, after Hollywood dancers Fred Astaire and Ginger Rogers. Although Gehry is keen to discourage the association with Hollywood, which he has come to consider too kitsch, the comparison has stuck. The two sections of The Dancing House are supported by pillars, which help to anthropomorphize the swaying forms. The glass tower (Ginger) narrows at the "waist" and appears to lean against its concrete counterpart (Fred). The latter is topped with a twisted metal structure, which some have nicknamed Medusa. The building consciously mirrors the vernacular styles on either side of it, appearing as a distorted version of the neighbouring buildings, an effect that is emphasised by the misaligned and protruding windows. The interior spaces, like the exterior form, are asymmetrical. British architect Eva Jiřičná, who designed the interiors, used techniques from the design of ships in order to maximise these limited and potentially awkward spaces. The site of The Dancing House is extremely small, to the extent that French architect Jean Nouvel turned down the project for this reason. It is, however, one of historic significance, since the house that previously occupied the space was destroyed in the USA's bombing of Prague during the Second World War and the ruin remained on the site for a considerable time afterwards becoming a symbol of the conflict. The area is next to the Vlatava river, in a square of Baroque, Gothic and Art Nouveau buildings, for which Prague is well known. Despite some controversy surrounding the disruption to the area's historic character, it has become one of Prague's most famous and popular modern buildings. Artwork description & Analysis: The Guggenheim Bilbao is often considered Gehry's most famous building, positioned along the Nervión River in the old industrial center of the city. The client, director of the Solomon R. Guggenheim Foundation, Thomas Krens, encouraged Gehry to produce an innovative design which would reflect and enhance the contemporary art collection that was to be housed inside. The building received an overwhelming positive critical response, which was, perhaps, best epitomized by the architect Philip Johnson, who called it "the greatest building of our time". It is frequently named as one of the most important works of contemporary architecture in surveys such as the World Architecture Survey. Designed using pioneering 3D modelling software, the Guggenheim Bilbao comprises a group of interconnected volumes in stone, glass and titanium-clad steel. The random arrangement of protruding shapes on the building's exterior give a very different effect when viewed from different angles, but they belie the organization within. Inside a variety of irregularly shaped gallery spaces (that can accommodate a variety of artworks, including those of a monumental scale) are arranged around an atrium, which is filled with natural light and offers picturesque views of the surrounding hills and estuary. The architect said of the building's geometry: "the randomness of the curves are designed to catch the light". The metal cladding references the industrial past of the city, whilst also being reminiscent of the sea faring vessels that transported goods into and out of the port. Art critic Calvin Tomkins likened the whole to "a fantastic dream ship of undulating form in a cloak of titanium". As well the sails of a ship, its appearance has also been compared to a fish. Both Gehry and his critics have acknowledged a recurring fish motif throughout his work; in silvery scale-like cladding, in curving protrusions like fins, and, more explicitly, in his fish sculptures El Peix (The Fish, 1992) and Standing Glass Fish (1986). Whilst some suggest the theme is inspired by ancient symbolism, others propose it recalls aspects of Gehry's childhood: the carp kept by his grandparents or even to the traditional Jewish gefilte fish dish. 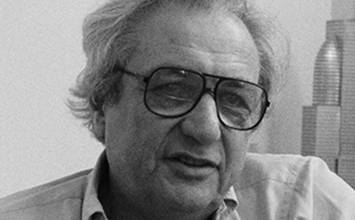 Gehry himself has said: "I never intended to build fish ... In my mind, I say 'Enough with the fish.' But it has a life of its own". The building, as well as the gallery it houses, has made Bilbao into a popular tourist destination and boosted the city's economy to such an extent that similar surges are now dubbed "the Bilbao effect". (One statistic has the number of foreign visitors to Bilbao increasing seven-fold between 1999 and 2011, with a boost of billions of euros to the local economy). Consequently, the museum has become as famous for its economic effect as its striking appearance. 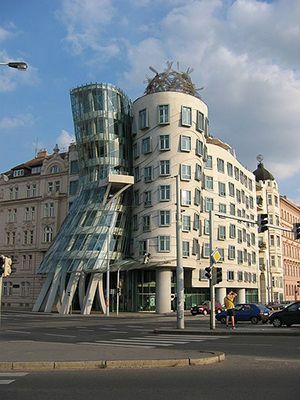 Some have linked the Bilbao effect to the notion of "starchitecture" (architecture of showstopping or celebrity status), but Gehry has repeatedly and violently rejected this label, stating that he is "just an architect", whose job it is to make buildings that are "technically and financially good". Since 1997 there have been other attempts, both successful and unsuccessful, to revitalize areas in this manner, for example Daniel Libeskind's expansion of the Denver Art Museum and Gehry's Walt Disney Concert Hall. Artwork description & Analysis: Walt Disney Concert Hall is the fourth hall of the Los Angeles Music Center. Named in honor of the renowned animator and film producer Walt Disney, it was built with funds donated by his widow. 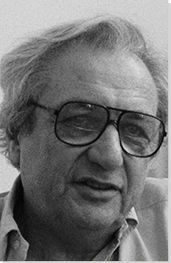 Gehry was appointed as the architect for the project via a competition, with a proposal that combined the design of both the building and outdoor space around it. The hall shares many similarities with the Guggnheim Bilbao, which it predates in design though not in completion. Conceived in 1991, the project faced significant political and managerial impediments in its first three years. Both buildings date from a period during which Gehry was exploring new shapes that could be created using 3D modelling software. As such, they have in common an ambitious and fluid design, developed first in free-hand sketches and then by computer. Whilst some have compared the form of the Walt Disney Concert Hall to the sails of a boat, others believe the building symbolises musical movement or the motion of the city, as its curved shapes reflect the light differently at different times of day. Initially intended to have a stone cladding, this was abandoned in favour of thin metal panels following the completion of the Guggenheim, as it was found that malleable metal better facilitated the adventurous curves of the design. Inside, the concert hall was conceived as a democratic space and there is no division between orchestra and audience, nor partitions such as boxes amongst the audience itself. The audience surround the orchestra entirely, such that, unusually, some listeners are facing in the same direction as the players. This arrangement was inspired by the director of the Los Angeles Philharmonic orchestra, who was keen to avoid any sense of hierarchy. In a similar vein, partitions within the interior space are avoided. This is achieved through the use of a steel roof structure that spans the hall in its entirety - a remarkable feat given that it seats over 2000 people. Glimpses of the steel framing can intentionally be caught by those within the hall - perhaps adding to the sense of collaboration. A curved ceiling that echoes the building's external geometry is both visually appealing and helps to achieve spectacular acoustics, for which the building has been praised along with its appearance. The project was not, however, without its challenges. Whereas Gehry has built a reputation for adhering to budgets, the concert hall was an exception. The architect faced legal action as a result of its having exceeded budget by over a 170 million dollars. Additional problems were identified with the building itself. Specifically, the reflective exterior surfaces under the Los Angeles sun caused the surrounding sidewalk and buildings to increase dramatically in temperature - requiring some of the panels to be sanded to a matt finish to mitigate the glare. 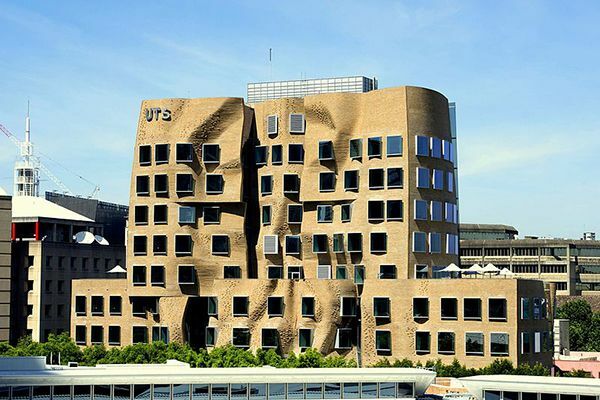 Artwork description & Analysis: The Dr Chau Chak Wing for the University of Technology, Sydney marks the introduction of Gehry's architecture to Australia. Named after the Chinese Australian businessman and philanthropist who financed its construction, the 13-story building is a hub for teaching, learning and research for around 1500 students and staff. It serves as an embodiment of the university's progressive ideals and has become an iconic and intentionally controversial landmark. According to Gehry, the building's design was inspired by the concept of a treehouse. The architect saw it as: "a growing, learning organism with many branches of thought, some robust and some ephemeral and delicate" and it marks a clear departure from his famous silver metal structures. The result, however, is much more closely associated by critics with a "squashed brown paper bag", owing to its undulating, almost crumpling, form. The comparison is often made in good humor, for example Australia's governor general Peter Cosgrove called it "the most beautiful squashed brown paper bag I've ever seen", whilst Gehry acknowledged that "Maybe it's a brown paper bag, but it's flexible on the inside, there's a lot of room for changes or movement." The building's distinctive front-facing façade is made from over 320,000 hand-placed bricks, whose sandstone color are said to reference Sydney's architectural past. The curving shapes, however, subvert the standard symmetrical design of nearby corporate and industrial buildings and create a sense of texture and movement, whilst the sculptural detailing and rectangular windows bring a human scale to the building. Gehry is said to have drawn inspiration for the folding design from the draped clothing and fabric of classical statues. On the other hand, the reverse façade has a contrasting appearance made up of asymmetric panels of glass, thus it similarly acknowledges its surroundings by offering direct reflections of the neighborhood. The interior of the building is built predominantly in timber, with a central sculptural staircase made from steel. With a range of classroom types to support different types of learning (as well as various facilities such as a theatre and café), the building is particularly well-suited for technology-based study, perhaps reflecting Gehry's own use of technology in his designs.